AID 3 is a test battery for use with children and adolescents that provides a clear profile across several abilities, such as verbal and manual. It applies adaptive item selection according to the test taker’s level of proficiency for ten subtests and one add-on test, allowing for high accuracy of measurement using relatively few items. The twelve subtests and five add-on tests of the AID 3 measure specifically defined abilities in a uniquely adaptive format. The core subtests involve ‘verbal-acoustic’ and ‘manual-visual’ tasks, and some subtests can be administered in different formats, and thus adapted to suit the situation. By default, in ten of the subtests (and one add-on test) item groups are administered step by step in a way that suits the test taker’s performance judging from preceding item groups. Conventional testing is also possible, which can be specific to the test taker if desired. Five subtests (and one add-on test) may even be administered (adaptively) as short forms, and there are parallel forms for eight subtests in case a second test administration takes place after a short period of time. 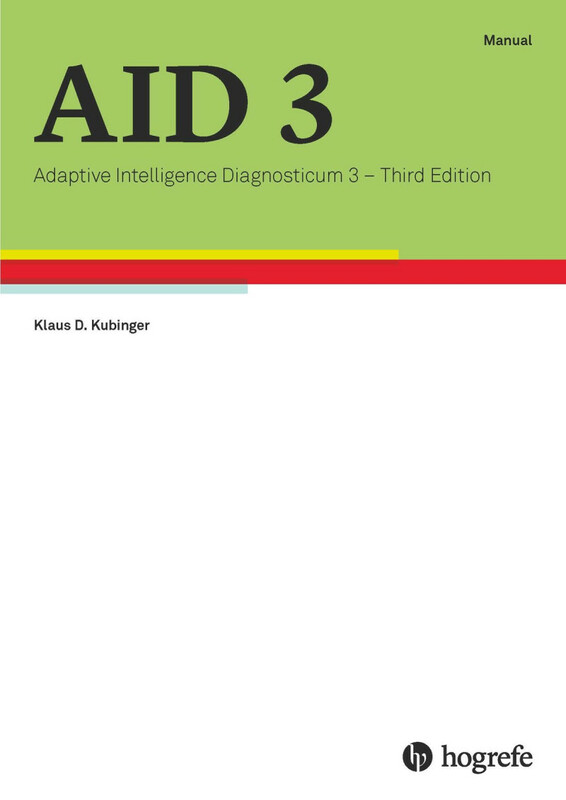 The AID 3 is applicable in educational psychology, developmental psychology, clinical psychology, educational consulting, and for test takers whose first language is not English. Standardisation is based on a sample of 1098 children and adolescents (sampled 2010-2013), adjusted according to the afore established progress of test performance depending on age. Depending on the accuracy of measurement about 40 to 75 minutes; for each add-on-test an additional two to 10 minutes.